Q. How do I request an item from the library annex? The catalog says the item is in the Library Annex and has a message, "Request this Item." What do I do? 1. Click the “Request this item” button in the library catalog. 2. Log in with your UARK username and password. If you are not a current student, faculty, or staff member but have a library borrowing account, then login with your last name and UA ID number. 3. Choose the pickup location for your item. 4. Select the item you wish to request, then click REQUEST SELECTED ITEM. You will receive an email as soon as the item is available for pickup at the location you designated. You can log in to “My Library Account” at any time to see your outstanding requests and holds, current checkouts, to renew items, or to save lists of records or past checkouts. Use the Request a Chapter Scan or Request an Article Scan buttons to have portions of an item scanned and emailed to you through the ILLiad system. 1. 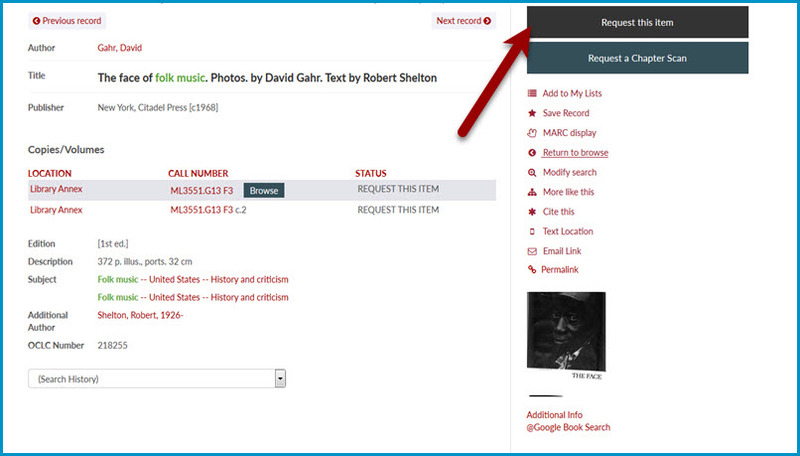 Click the Request a Chapter Scan or Request an Article Scan button on the library catalog record for the item. 2. You will be prompted to log in to your ILLiad Interlibrary Loan Account. Don’t have an account? There is a link to create one; you’ll just need your 9-digit UARK ID number and email address. 3. ILLiad automatically fills out details for you, such as book or journal title and call number. You will want to provide details about the chapter or article that you need scanned, such as volume and issue, pages, article/chapter author, and chapter/article title. That’s it! You will receive an email as soon as the scan is available in your ILLiad account.